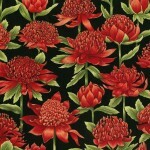 100% Cotton, high quality patchwork, quilting, craft and sewing fabric. Lovely earthy Australian colours. 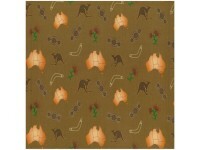 A toss of orange Australian maps with dark brown kangaroos and small sprays of grevillia, all on a light brown background.